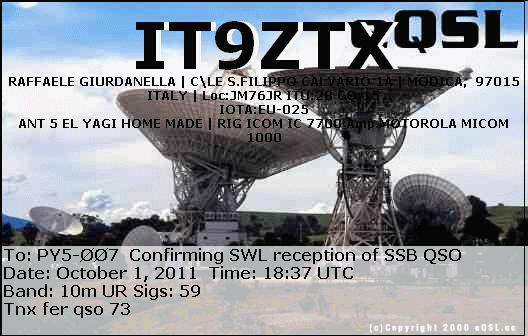 eQSL recebido: IT9ZTX, Modica, Italy, 28 MHz, QSO w/ CE4SES. 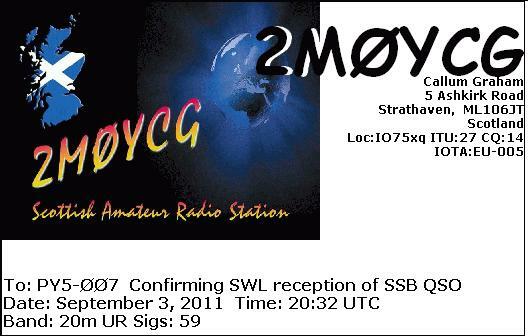 eQSL recebido: 2M0YCG, Strathaven, Scotland, 14 MHz, QSO w/ PY6HD. 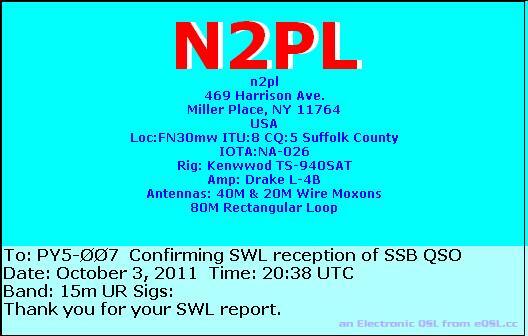 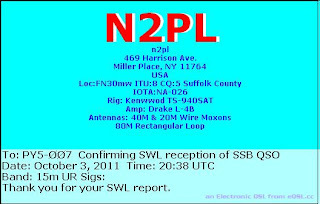 eQSL recebido: N2PL, Miller Place, NY, United States, 21 MHz, QSO w/ CX3TQ. 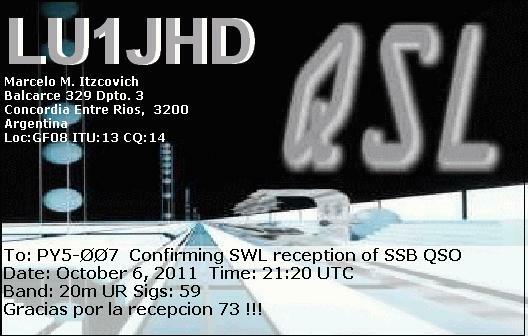 eQSL recebido: LU1JHD, Concordia, Entre Ríos, República Argentina, 14 MHz, QSO w/ UY2UA, UY2UQ. 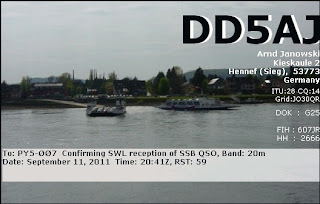 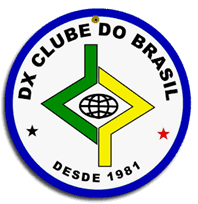 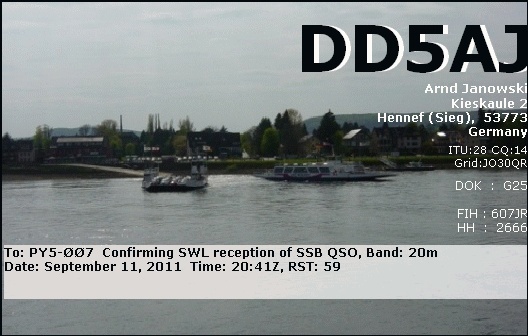 eQSL recebido: DD5AJ, Hennef, Sieg, Germany, 14 MHz, QSO w/ AY5F (Contest WEA). 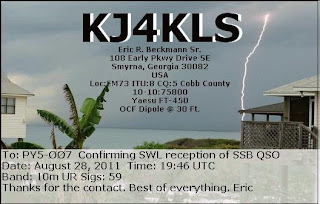 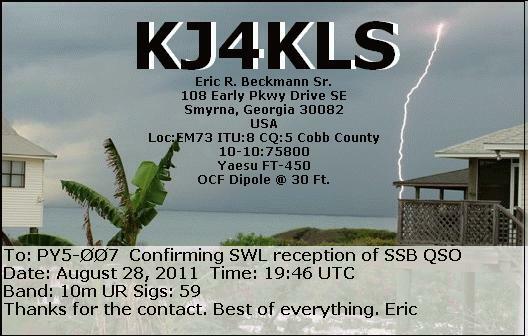 eQSL recebido: KJ4KLS, Smyrna, Georgia, United States, 28 MHz, QSO w/ ZY6Z (Contest CVA). 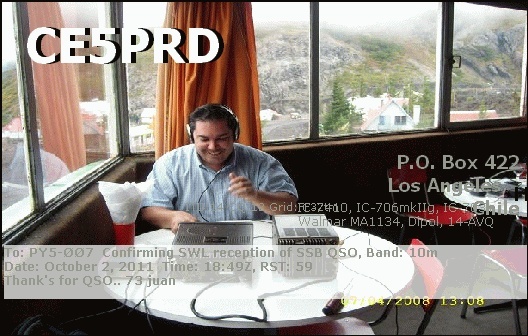 eQSL recebido: CE5PRD, Los Angeles, Chile, 28 MHz, QSO w/ IK1YDB. 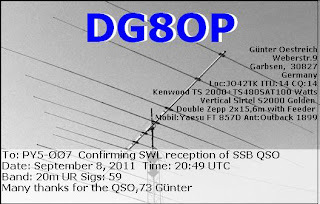 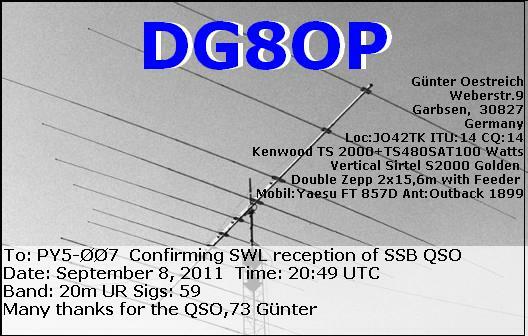 eQSL recebido: DG8OP, Garbsen, Germany, 14 MHz, QSO w/ PY6RT. 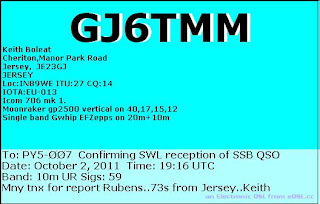 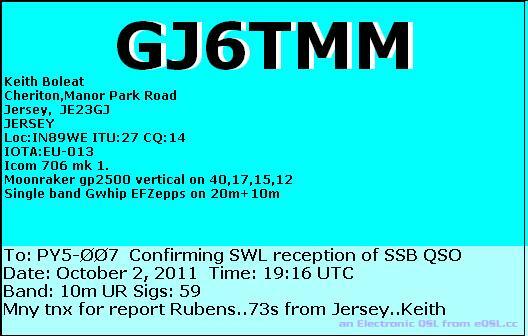 eQSL recebido: GJ6TMM, Jersey, Jersey (Channel Island), England, 28 MHz, QSO w/ LU4MCS. eQSL recebido: RL3AW, Moscow, Russia, 21 MHz, QSO w/ XR30BZ. eQSL recebido: LW4DVA, Quilmes, Província de Buenos Aires, República Argentina, 28 MHz, QSO w/ 4T100MP. 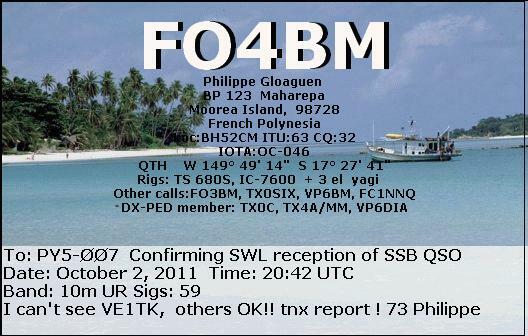 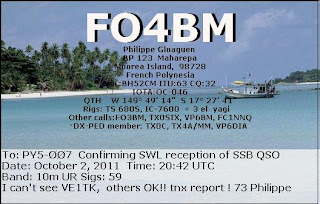 eQSL recebido: FO4BM, Moorea Island, French Polynesia, 28 MHz, QSO w/ K3EEI, N4WMB. 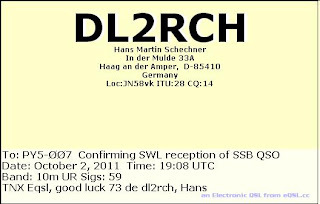 eQSL recebido: DL2RCH, Haag an der Amper, Germany, QSO w/ LU4MCS. 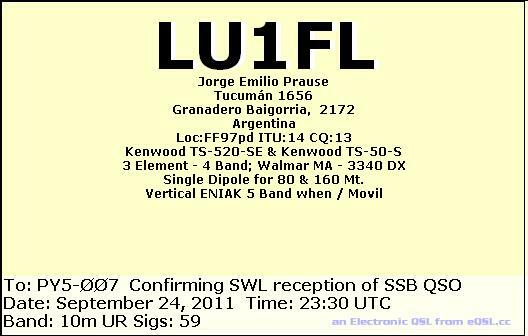 eQSL recebido: LU1FL, Granadero Baigorria, República Argentina, 28 MHz, QSO w/ K3ZO. 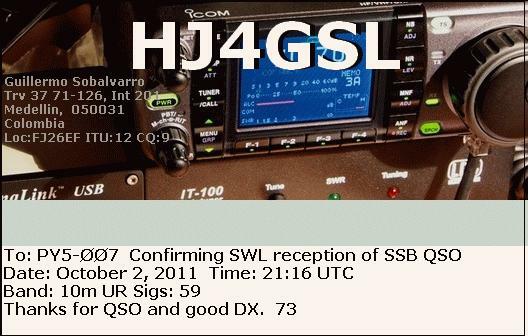 eQSL recebido: HJ4GSL, Medellín, Colombia, 28 MHz, QSO w/ LU3MCJ. 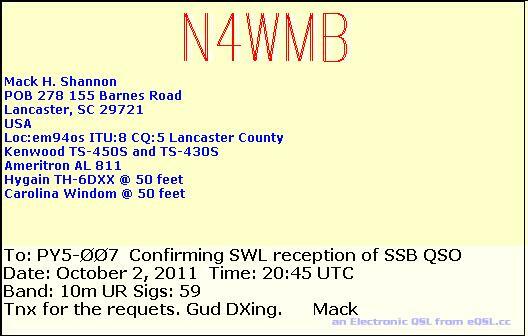 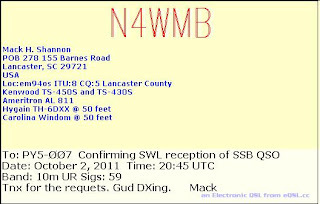 eQSL recebido: N4WMB, Lancaster, SC, USA, 28 MHz, QSO w/ FO4BM. 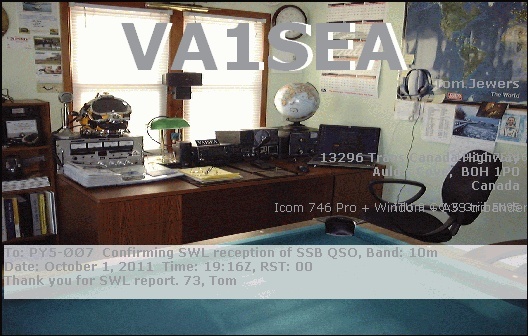 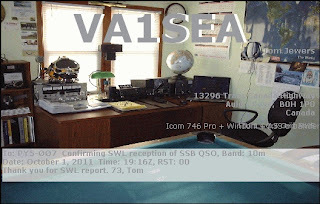 eQSL recebido: VA1SEA, Auld`s Cove, Guysborough County, Canada, 28 MHz, QSO w/ CE4SES. 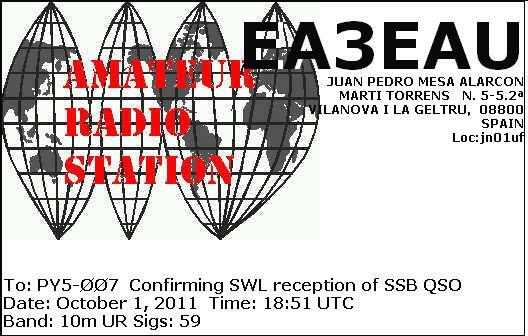 eQSL recebido: EA3EAU, Vilanova I La Geltru, E, 28 MHz, QSO w/ CE4SES.